Little Richard earned his spot here by being one of the pioneers or Rock and fathers of The Golden Age of Rock. He was a first generation rocker. Born in 1932, Little Richard was a teen when the boom time of music expansion hit the world. With WWII and the great depression behind, the 50s were times of new technology, increased leisure time, and a growing economy. 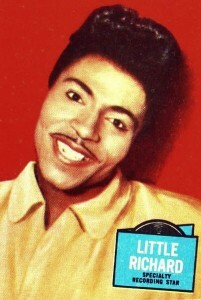 Little Richard pictured on a 1957 Topps gum trading card. Little Richard, birth name Richard Wayne Penniman grew up in Macon Georgia. Like many Afro-Americans, his first music performance experiences were at church. 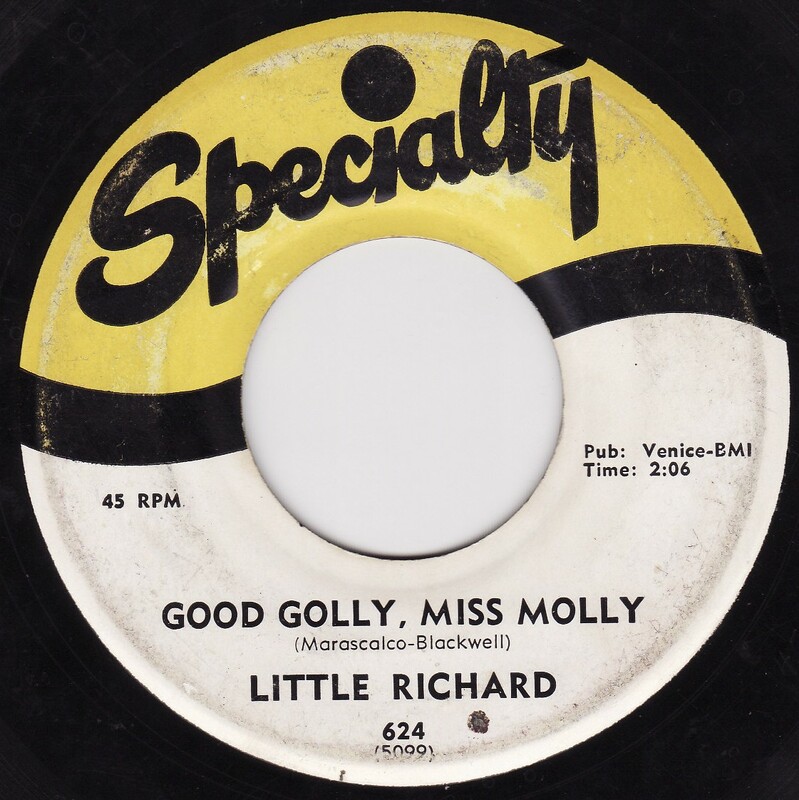 When he was 14, Little Richard performed with Sister Rosetta Tharpe. Tharpe was another of the early rockers. She started in gospel and moved towards what was soon to be known as rock. Along the way, she earned the titles of “the original soul sister” and “the godmother of rock and roll”. Sister Rosetta Tharpe was also noted as an influence on Jerry Lee Lewis, Elvis Presley, and Johnny Cash. His family had strong rules prohibiting singing or listening to R&B (rhythm and blues) music; they called it “devil music.” It wasn’t until 1948 after his family kicked him out of the house that he performed his first R&B song. It wasn’t a happy time for Little Richard, but it was a great time for the music world. By 1955, Little Richard had recorded a couple of demo records and had his first big hit with Tutti Frutti late in the year. It hit #2 on the Billboard R&B chart and surprisingly also crossed over to reach the top 20 on the pop chart. His next hit single “Long Tall Sally” reached the top ten on the pop chart. Both singles sold over a million copies. Launched to fame from his hit records, Little Richard went on tour with his trademark high energy stage performance. He’s known for running on and off the stage, pounding on the piano, shouting lyrics, and sexually suggestive lyrics. He’s also known for having some of the earliest mixed-race audiences. During the 50s, and especially in the South, public places were divided into “white” and “colored” areas. Audiences were still split. Usually white’s on the lower level and blacks in the balcony, but it was a start. 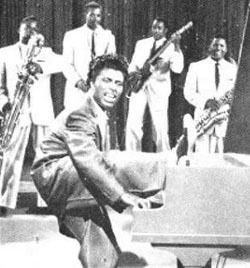 Little Richard was often booked as the last act of the show because, by the time he was through, people would be out of their seats with whites and blacks mixed on the floor dancing. And it was probably also because no other act could catch the audience’s attention after him. Little Richard, Richard Wayne Penniman was one of the ten original inductees into the Rock and Roll Hall of Fame and his recording of “Tutti Frutti” is in the Library of Congress’ National Recording Registry, with the note “unique vocalizing over the irresistible beat announced a new era in music”.